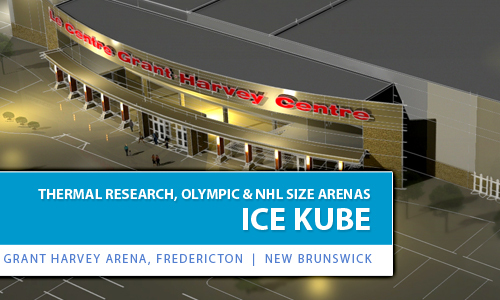 Ice arenas are unique buildings from an energy perspective and provide the user with energy cost saving advantages. The amount of heat extracted from a sheet of ice can easily be directed back into the building and provide the user with a low cost heating source for heating the building and hot water requirements. 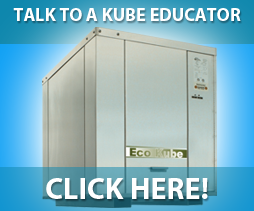 The Kube Solutions unique design incorporates features that allow the heat pump to operate well below the temperatures of other heat pump designs. Our patented “buffer” design provides a free energy source that incorporates a second layer of rink pipes located a foot below the main rink layer. This buffer system can pull additional BTU’s when the top layer of ice is at set-point or the system can draw energy from both layers at the same time to provide more energy than the facility can consume. With this buffer system installed, arenas are now being designed as an energy source for thermal storage designs where the additional energy stored is in the earth, outside the rink, and used by adjacent buildings (similar to a District Heating System).